Ed Brown Special Forces Bronze. Click to enlarge. Never have we had such an embarrassment of riches as today. Even the average custom gunsmith or 1911 builder of today produces a product superior to the master craftsmen of the early days of IPSC, and the best today produce perfect samples of the 1911. Ed Brown Products is one of the, if not the, best when it comes to making classic 1911s. You will not see the usual post-"Miami Vice" extras that the blinged 1911 is prone toâ€“my personal irritant being the full-length guide rod. What you get is a 1911 built as a London Best shotgun maker would make were he making 1911s. Travis Brown, son of the founder, and the man who runs the day-to-day operations, corrected me on that one, with a smile in his voice. "Patrick, if someone wants a full-length guide rod, we'll install it. We're still a custom shop, after all." The pistol sent for my testing (and covetous lust) is the Special Forces Bronze, a Government-size, all-steel 1911 in .45 ACP. The Special Forces model is one of the company's most popular guns. The Special Forces is meant as a hard-use working gun. As a result, it has a set of Novak sights on top of the slide, fixed night sights in dovetails. As fixed sights, they are almost indestructible, unlike even the most rugged adjustable sights. The Special Forces also has a smooth, round-topped slide; it lacks the sight grooves found on the firm's Classic and Executive models. Yes, grooves look good, and they can, in some instances, cut the glare on a competition range, but they don't do much on a working gun. So Ed Brown's crew dispenses with them. The Special Forces model uses only Ed Brown parts, as do all Ed Brown 1911s: slide, frame, barrel, slide stop, bushing, fire control parts and both the thumb and grip safety. I'll ask you to look for a moment at the two safeties. 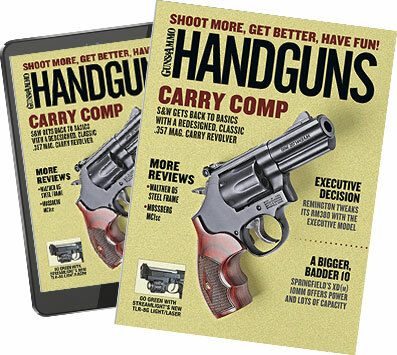 The thumb safety and grip safety look so normal, so customary, that it may be hard to realize what a revelation they were when they first appeared on IPSC ranges in 1989. No grip safety in existence allows your hand a higher hold on a 1911 frame than the Ed Brown Memory Groove does, and few thumb safeties are as ergonomically fitted to the shooter's hand. I was building 1911s back then, and after the first time I shot an Ed Brown grip safety-equipped 1911, I installed no other on my pistols. Ditto the thumb safety. Since Ed Brown machinists make the slide, frames, barrels and so on, there is no question about proper fit when it comes time to assemble a pistol. If by some bizarre happenstance a slide doesn't properly fit onto a frame, the brass doesn't have to email or call a supplier and ask what the deal is. "We're in a 20,000-square-foot, state-of-the-art facility," Travis said. "We're eyeball to eyeball every day." The slide-to-frame and the barrel-to-both fits are about as close to perfect as the human hand can make them. And when it comes to those slide and frames, they are CNC machined from forgings. There are no cast parts, no MIM parts, no shortcuts and nothing that isn't exactly to spec. But we don't shoot pistols for the perfect fit of metal. We shoot them to build skills and strike targets. And so what matters here are fit to the hand, trigger press and a non-slip grip. The frontstrap of the Special Forces Bronze has an undercut at the top, below the trigger guard, and that—combined with the grip safety—gets your hand as high as humanly possible on the frame. The good thing is that it helps control recoil and muzzle rise. The bad thing is that it lifts your hand away from the grip safety. No problem. When Ed Brown designed his Memory Groove grip safety way back when, he added a block of steel to the grip safety to fill the gap. You thought that the block was always there, always a part of the 1911? No, it wasn't, but it is now. On the frontstrap and the flat mainspring housing, the Special Forces Bronze has the Ed Brown Chainlink III treatment. Typically, the classic form of non-slip frontstrap treatment offers you two choices: non-slip and hand-grinding or hand-safe and not so non-slip. Sharp, 20 or 25 lpi checkering will keep the pistol from slipping in your hand, but the price is steep and sometimes painful for those who have desk jobs. Chainlink III is both less aggressive and more non-slip than the previous iteration, Chainlink II. Even when I was shooting the hot defensive loads out of the Special Forces Bronze, the frame was not slipping in my hands. Travis confirmed my thought on that. "Some thought Chainlink II was too aggressive," he said. "Chainlink III is less aggressive, but attractive and functional. We still offer both." When talk turns to custom 1911s, the baseline assumption of many is that the trigger must be tuned to baby's-breath lightness. Nothing heavier than that will do, and nothing heavier will allow the user to shoot to the capability of the pistol. Here's a shocking fact for you. There are maybe a dozen shooters in the country who can shoot up to the accuracy potential of any 1911â€“ let alone one as well-built as the Special Forces. As long as a trigger is clean and crisp, you are going to do as well with it as you are going to do. So after dry-firing the Special Forces Bronze and remarking to myself on how nice a trigger it was, I did my range work. I shot over the chrono, I shot for groups, and then I sat down with the measuring tools to see what the trigger pull was. I always wait to do that until after I've shot a handgun for at least one range session because a brand-new trigger pull can show some variance until it wears in and the parts have a chance to burnish themselves against each other. Imagine my surprise when I weighed the trigger and found it to be an absolutely consistent four pounds, eight ounces. "That can't be," I said to myself. I held it up to dry-fire and again thought it had to much lighter than that-3.5 pounds, I was sure. Back into the vise, The Lyman Digital trigger gauge read four pounds, eight ounces. Again. Travis told me they're able to get a trigger to feel like that thanks to years of experience, but he did note that the allowed weight variance in the Special Forces spec sheet is 3.5 to 4.5 pounds. Me, I'd be happy with this one: a 4.5-pound trigger that feels a pound lighter. When the subject of custom 1911s comes up, there are two expectations besides an impressive cost: accuracy and reliability. Let's get the reliability question out of the way first. I have never seen an unreliable Ed Brown 1911. Back when single-stack 1911s were still ruling the roost in IPSC, and for a decade after that on bowling pin ranges, I never heard of a single Ed Brown where the owner complained about its function. I've never had one I was testing or using ever give me the slightest problem. I'll admit that I haven't shot a statistically relevant sample of them, but if someone paid a lot of money for a custom gun and it wasn't reliable, they'd say something. This one was no exception: 100 percent reliable. As for accuracy, a full-size 1911 is about the easiest big-bore handgun to shoot well. And at the same time, it's one that will show you your faults. When you've got four shots touching at 25 yards, the smallest oversight in technique will blow the group. You can get sloppy with a less accurate pistol and who would know? That trigger-nudge that just "opened" your 3.5-inch group by another quarter-inch? So what? An accurate 1911 lulls you into a sense of "I've got this." And then you admire your group before you're done, and your one-inch group is now two inches. Poor baby. This Special Forces, like all Ed Brown pistols, is brilliantly accurate. But you have to do your part. And if you get tired, it will mock your efforts. I asked Travis about the company's testing. He was understandably reserved. "It depends on the ammunition and shooter," he said. "With the right ammo out of a rest we can regularly get one-hole groups." Translation: If your Ed Brown doesn't shoot as well as you think it should, perhaps the answer comes from Shakespeare's "Julius Caesar": "The fault, dear Brutus, lies not in our starsâ€¦." The fault lies not in your pistol but in your ammo. Or your technique. So I laid off the coffee, at least as much as I could and still function, and did my best to shoot one-hole groups. Mostly I failed, if you can describe a continual series of groups smaller than two inches a failure. The one exception was Liberty Ammo's Civil Defense, which shot larger—but still gratifyingly small—groups. And can you really complain about a two-inch average group size? So why Bronze? Travis told me they had a lot of customer feedback on that. Customers liked it, the crew at Ed Brown liked it, so the company offered it beginning in May of last year. And it has sold very well. It's not difficult to see why. And to make the situation even better, there's the price. I know custom gunsmiths who have years-long waiting lists. The average monthly mortgage payment in America today is $865, and I know gunsmiths who routinely charge four mortgage payments worth of cash to overhaul your 1911. You can have a brand-new, no extras needed, Ed Brown Special Forces Bronze for $2,495. Since Ed Brown is still a custom shop, what if you have an Ed Brown and you want it to be bronzed? No problem. Ed Brown Products would be happy to recoat your existing Ed Brown 1911 in Battle Bronze. Okay, you say, but how long will that take? "We have a week or two turnaround on that," Travis said. For a moment I thought I had misheard. How long? "A week or two." There has been a trend in the last few years of trainers and competition shooters getting or building 9mm versions of their .45 1911s. Back when ammunition was reasonably priced, a 9mm practice gun saved money, and price notwithstanding, a 9mm saves wear and tear on wrists and elbows. So any chance of a Special Forces Bronze in 9mm? Travis was just encouraging enough to make me mull my options. "If someone has a 9mm Ed Brown, we can refinish it for them." You see, Travis and the crew do a small run each year of 9mm pistols, for insistent shooters like me, and the 9mm Ed Brown 1911 does exist. "There are some for sale out there right now through our dealer network." So until I can track down a 9mm Ed Brown and send it in to be rebuilt as a Special Forces Bronze, I'll just have to content myself with using this .45 ACP one. I think I can stand up to the strain.